UNIVERSITY PARK — Trace McSorley enjoyed a terrific week last week, with not just one, but two neat things happening to him. First, Penn State’s senior quarterback took part in the prestigious Manning Passing Academy, which wrapped up last Sunday in Louisiana. Then on Tuesday, USA Today selected McSorley as the best quarterback in the country entering the upcoming college season. Add all that to McSorley being mentioned in preseason Heisman Trophy discussions, plus various publications pointing out he could wind up being the greatest quarterback in Penn State history, and it’s been quite a fun offseason for the lightly recruited, yet tremendously productive signal caller. McSorley, though, remains ever so grounded. He likes the attention, sure. Who wouldn’t? But he knows what it means and doesn’t mean in the grand scheme of things. As successful as he’s been, McSorley has never been one to receive a great deal of hype. He won three Virginia state championships and played in the title game four times in high school, yet virtually no colleges looked at him as a quarterback recruit. 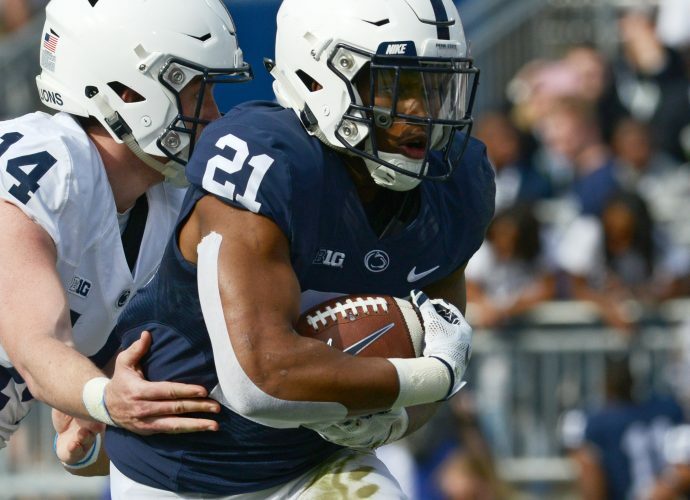 He has broken numerous PSU passing records the past two years while leading a potent offense, but it was star running back Saquon Barkley, not McSorley, who received the bulk of attention. Now, however, this is McSorley’s team. Penn State will go as far as he can take it this season. And he knows that the full focus of every defense will be on stopping him now that Barkley is gone. How will that change his approach to the game? “I’ve always approached the game that defense is going to try take what I do away, so my approach doesn’t change too much,” McSorley said. Those answers include a lot of talented playmakers and an offensive line that’s expected to be much improved. Then again, there are big questions on offense after the departures of Barkley, tight end Mike Gesicki and receiver DaeSean Hamilton, and we’ve heard time and time again in recent years that the O-line would be better, only to struggle and fail to meet expectations. So in short, there are no guarantees for Penn State’s offense. He has always found a way to make things happen, and as long as he can stay healthy, he’s running the perfect kind of system for his skill set. “People always ask me, ‘How are you going to replace a guy like Saquon?,” McSorley said. “I think part of it is we’re going to have all that depth at the offensive line that’s going to be one of our strengths this year. That’s something I’m really excited about. … I think we’re going to be able to improve from our offensive line standpoint as far as our run game. As far as losing most of his best playmakers from a year ago, the quarterback has plenty of confidence that there are players in the program who can step into those roles and produce. “You lose a guy like DaeSean, who’s been here for five years. Mike played four years and a guy that set records here. And obviously Saquon with the things he’s done,” McSorley said. “Really, what we’re going to need to make up for is the experience. All those guys had three, four years under their belt of playing at Penn State and playing on the road in Big Ten games, and they’ve been through just about everything. McSorley and some of the other top quarterbacks in the country took part in the annual Manning Passing Academy, where they got to be around Peyton, Eli and Archie Manning. “That was awesome,” McSorley said. “The Mannings are first-class people. Every second, Archie was asking, ‘How is this for you guys? Is this everything you want it to be, are you getting something good out of it? Even at the Manning Academy, though, McSorley still found himself answering questions about Barkley. It was understandable, though, given that the questions came from New York Giants quarterback Eli Manning, who now has Barkley as his teammate. “I got a lot of questions about Saquon,” McSorley said. “We just kind of talked about how he is and … how he’s going to want to know exactly how Eli’s thinking. In pass protection, in run game and all that kind of stuff, he wants to absorb all that knowledge. He wants to be a quarterback as far as the knowledge.